If you could protect yourself against cancer, would you? It turns out, in some instances, you can. More than 90 percent of skin cancer diagnoses are a result of excessive ultraviolet (UV) ray exposure from the sun and tanning beds, making it one of the most preventable of all existing cancers. According to the Skin Cancer Foundation, approximately 3.5 million Americans are diagnosed with skin cancer each year; more than breast, lung, prostate and colon cancers combined. Globally, it accounts for approximately 40 percent of all cancers and causes 80,000 deaths a year, a trend that has increased nearly 60 percent over the past two decades and continues to rise. Until recently, skin cancer prevention meant the use of sunscreen, sun-protective clothing and a reliance on public awareness. The June bracelet by Netatmo wants to change that. The bracelet is the first UV-awareness device of its kind. Within its attractive, centerpiece jewel is a sensor that measures and communicates UV ray exposure. The June bracelet uses its corresponding iPhone app to offer real-time, sun protection advice like what level of SPF sunscreen to use, when to reapply sunscreen throughout the day and when to wear hat or sunglass protection, all based on the user’s skin profile. It’s like having a personal health navigator on your wrist, one that’s fashionably chic. The bracelet was designed by French jewelry designer Camille Toupet, who gave it a high-end aesthetic to supplement its technological feel. The $99 jewel bracelet (or brooch) is available in three colors: platinum, gold and gunmetal. The jewel is interchangeable and can be attached to a double-stranded leather or silicon bracelet based on the wearer’s needs. Like every piece of technology, the bracelet does have its limits. The app is only available on the iOS operating system, limiting the product’s availability to those who have an iDevice. Secondly, the UV sensor is not waterproof, which is a problem if you’re around water for most of the day (when, let’s face it, most people need sun advice the most). 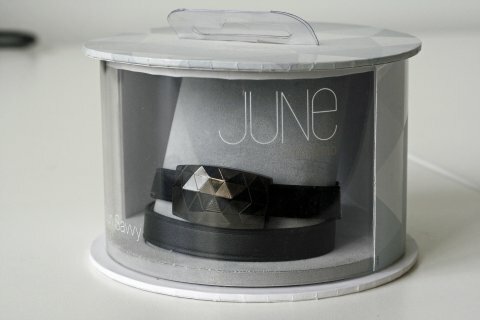 But the most glaring and disappointing issue with the June bracelet is that its design reinforces gender bias. Its dainty, elegant and to borrow a headline description from Mashable, “gorgeous” design in only available for women. Without context, this decision signifies that only women are beholden to prolonged sun exposure or frequent tanning sessions and really misses the heart of the bracelet’s sole purpose – to inspire immediate, real-time awareness about the short and long-term dangers of UV rays on the skin, for everyone. Worldwide skin cancer data suggests that men need skin protection just as much as women do, especially when considering the gender disparity statistics of melanoma, the deadliest form of skin cancer. While young men only account for 40 percent of melanoma diagnoses, they represent more than 60 percent of melanoma deaths. From ages 15 to 39, men are 55 percent more likely to die of melanoma than women in the same age group. Effective skin cancer prevention isn’t only about creating awareness, it’s about creating awareness sooner. Despite its novel and unique approach to skin awareness, the company missed a great opportunity to offer more to the world than a dainty, beautifully-designed bracelet. 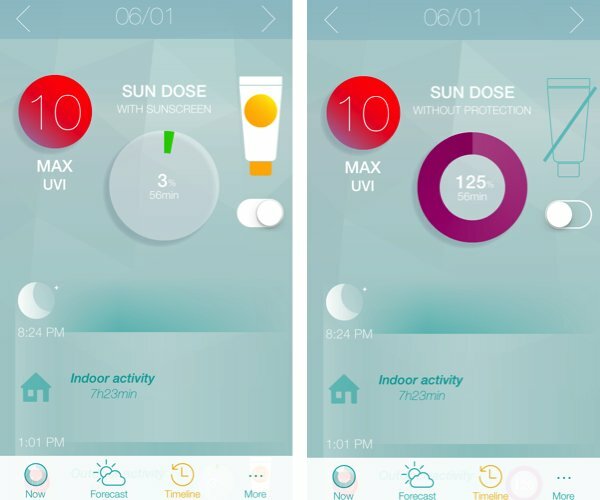 The June app works in coordination with the bracelet to provide the wearer with push notifications when UV exposure reaches a critical level.